Kanban — the Japanese word for "billboard" — is a term for the visual cues that might be used in a lean, efficient assembly line in order to expedite and smooth workflow. These signals get the workers what they need, where they need it, when they need it to create a just-in-time (JIT) production system. Over the course of the game, you persuade the board and the factory tender to help you develop and improve automobile parts. You make shrewd use of the outside suppliers and the limited factory supplies in order to appropriate needed part when the suppliers come up short. Because the factory must run at optimum efficiency, production doesn''t wait for you or for mistakes. The factory manager is a game-driven non-player character with two modes of play ("nice" or "mean") to offer a friendly or more competitive gameplay environment. If you want a seat on the board someday, you need to show that you can keep a complex machine running smoothly, efficiently, with everything happening just at the right time. 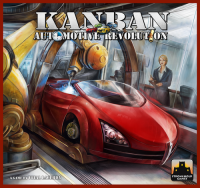 Kanban: Automotive Revolution is a pure Eurogame focused on economics and resource management that puts you in the driver''s seat of an entire production facility, racing for the highest level of promotion. This game is so awesome. I immediately bought it once available (though came with a hefty price) but no regrets. I found this game to be a true gem. This was in fact my first Vital Lacerda’s game, tried CO2 before but not complete so I don’t think that count. There are not many games with this theme, players working in a manufacturing car company. Some of the terms are unfamiliar in the game field so far, unlike terms from classic Euros. In this game you will work as employee to design cars, order parts, assemble these parts, test the cars and claim them to your garage. And also train, yes do not forget this, very important thing in your line of work. Of course since this is a company, there will be meetings to attend to, to discuss your performance and other important stuff, trust me they’re important. There are two important things in the game, which is points and time. Yes, you will use your given time wisely to gain better performance and prestige points, and lets hope you will be chosen as the next employee of the year. In each turn (I would say working day) you will choose in which department you want to work (now this is freedom), either in design department, warehouse, assembly, test and upgrade and HR department. The cycle in manufacturing cars are like this, first you need a design to make a car, once the design is there you need parts (there are 6 different parts) to assemble the car, after the car is assembled, you need to test it or upgrade it to have better performance. In some turns you can bank shifts (time) or even spend banked shift to work more in a day. Overwork is important but sometimes you need the payout later. While you working tirelessly there’s also someone who’s gonna monitoring you lazy labors, that’s the factory manager named Sandra (you know what, she’s the designer’s wife, so no cursing at her back, He will know). The scoring mechanics are amazing, you can get points from many things but the real deals are from meeting and getting max points from upgrade designs at the end of the week. Scoring performance goals from meetings are very interesting, just like meeting players will show performance based on the topics available or presented by one of the players. Also they can only score if they have seats available in the meeting. I think this one is better than The Gallerist in terms of streamlined, straightforward, tight and challenging with two modes of play. Need more planning in the long run, more contained, more controlled. The Gallerist is great, but I must say it’s more fiddly, more complex in the terms of components but more accessible to new players than Kanban (this is the highlight of my observation). While Kanban has higher learning curve, clever plays and interesting decision making that greatly affecting a player’s performance. And also tension, it has tension than The Gallerist. I love how Naomi Robinson did with the arts, instantly it may looks very busy and hard to see but once you play it, everything will come to sense quickly. Add a Review for "Kanban: Automotive Revolution"